We have started watching Chuck. For the education of those that have never watched Chuck, and the entertainment of those that do, I have figured out the pitch that got this show greenlit: It's "The Computer Wore Tennis Shoes" meets James Bond. Chuck is a popular guy that is down on his luck who accidentally becomes the repository of all of the government secrets. He has crazy adventures with his beautiful but dangerous CIA bodyguard and his dangerous but dangerous NSA bodyguard, all the while trying to get a real life. It's a funny show, has it's moments, and we're enjoying it. But there is one little thing that keeps popping up that makes me crazy. It took a little while for us to catch on to it, but once you see it, it just keeps showing its ugly head. And it's probably not what you think. The character of Chuck is a nice guy. We know this because we are told in every episode what a nice guy he is. Seriously, it's almost a drinking game. All his friends love him and are loyal to him in a way that is usually reserved for old army buddies that have a deep and terrible secret. 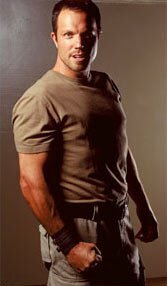 And in every episode, we are treated to Chuck being the comic/nice-guy foil to the serious government agents and the bad guys that they take on. But, and this is a pretty big but, there's been one tiny oversight. If Chuck was your friend, you would find every excuse imaginable to sever any ties you may have with him, pretending that you don't know him and perhaps burning any evidence that you have a shared history up to and including geographic locations. All the time that Chuck is gallivanting around, secretly saving the world from certain doom and destruction, he's still trying to hold onto whatever semblance of a real life he may have had. This includes working his day job to keep his cover. What this really means is that Chuck is drawing a paycheck while his co-workers and "friends" cover for him. Picture your place of business. In all probability, there is at least one other person working with you. I want you to picture your best friend is that person you work with. Now, imagine that they walks in and out of the office all day whenever they feel like it regardless of what's going on, leaving you to cover and pick up the slack. And not only do they continue to get paid, they are also considered for promotion to become your boss because YOU'RE the slacker. In a very short time, you would be cultivating your murderous thoughts into a diabolic scheme to remove said friend/co-worker from your life. But not in the world of Chuck! Not only can Chuck do the above, but he also gets insane favors that he never returns, but is always granted without any hesitation or question. In conclusion, Chuck is a big jerk. But it's still a funny show.